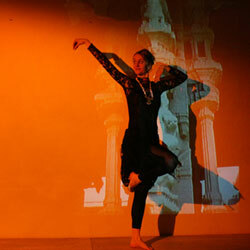 Dance Performances: Carolin Gödeke´s repertoire unites classical Indian dance and innovative choreographies. She is creating interdisciplinary performances, combining dance and elements of fine arts like video-projections, masks and puppets. Classical Indian Dance: Bharata natyam-dance has its origins in South India’s temples and is strongly connected with spiritual hinduistic traditions. There are pure rhythmic and very dynamic choreographies, as well as elements telling mythological stories by using a special language of hand gestures and facial expressions. Narrative and abstract dances are woven into each other in an intrigue, fascinating dance style. If you wish, Carolin Goedeke develops an individual concept for your special event. The duration of the dance programme can take 10-90 minutes. She needs a stage of 4 x 4 m minimum, dance floor, lights, cd-player and eventually a videobeamer.